Bright, brief, undeniably cute but still rather bland, Pip and Posy’s (The Scary Monster, 2012, etc.) third adventure involves a mishap with a red balloon. Vibrant gouache hues paint the everyday world of these two animal friends. 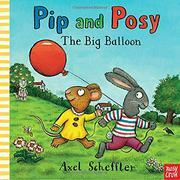 “Pip had a…balloon of his very own. He liked it a lot.” He shows it to Posy, and off they go on a walk. As they admire toys in a store window, “by mistake, Pip let the balloon go!” They chase after it until it pops on a sharp tree branch in the park. Pip is crushed: “He cried and cried and cried.” Toddlers and preschoolers will relate to Pip’s unfortunate turn of events and his ensuing tears. When Posy has the inspired idea to blow bubbles, Pip emerges from his misery and has some fun; they do not mind when they pop, “because that’s what bubbles are supposed to do!” Simple text constructed with a controlled vocabulary and presented in a large font may make this a decent choice for new readers as well as a read-aloud for toddlers, even though the relative lack of story and pat ending limit its overall appeal.